Sharing my Ultimate Breakfast Frittata today, perfect for weekends and celebrating! Paced with all of your breakfast favorites. You are in for a breakfast treat with my Ultimate Breakfast Frittata! Perfect for entertaining your family and friends on the weekends, brunch, special occasions. Such a delicious meal to prepare! Be sure to follow Picky Palate on Instagram for sneak peeks of what’s coming to to the blog! 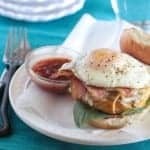 It’s always a pleasure partnering with Eggland’s Best Eggs to bring you new family-friendly recipes perfect for any occasion. 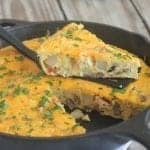 I put together The Ultimate Breakfast Frittata over the weekend that is packed with so many breakfast/brunch favorites! 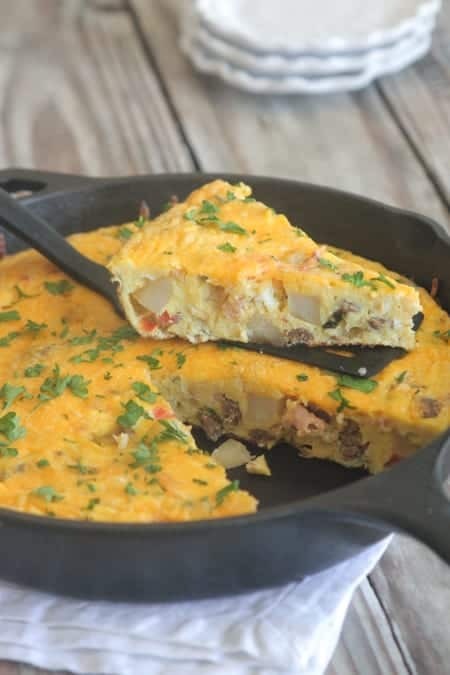 To prepare the Ultimate Breakfast Frittata, you’ll need some breakfast staples from the refrigerator such as eggs, diced potatoes, bacon and sausage and diced tomatoes to name a few. 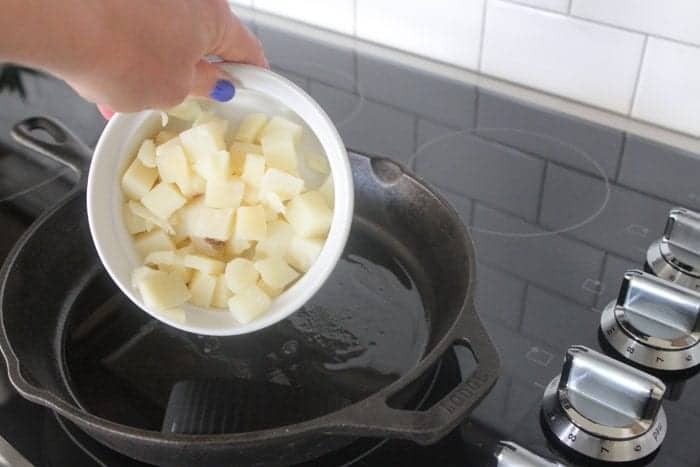 To start the frittata, add the diced potatoes to a hot cast iron skillet. Add the sliced green onions as well. 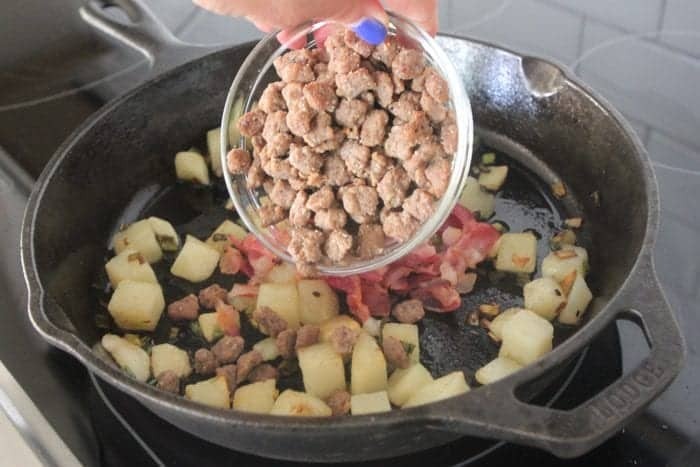 Once the onions and potatoes have sautéed, add the bacon. Add the cooked sausage as well. Slowly add the beaten Eggland’s Best Eggs. Cook slightly in the skillet then bake to finish cooking. Gorgeous and perfect for celebrating someone special, perfect for weekends! Enjoy! *Customize the recipe to your favorite breakfast ingredients. Add your favorite peppers, vegetables and other proteins if desired. *Serve your frittata with a fruit plate and tall glasses of Orange Juice. Enjoy! Preheat oven to 350 degrees F. and place 12 inch cast iron skillet over medium heat. 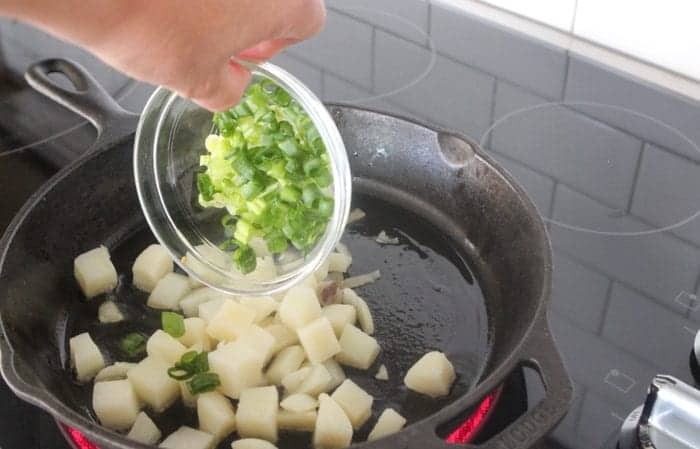 Place oil into hot skillet and add potatoes and onions. 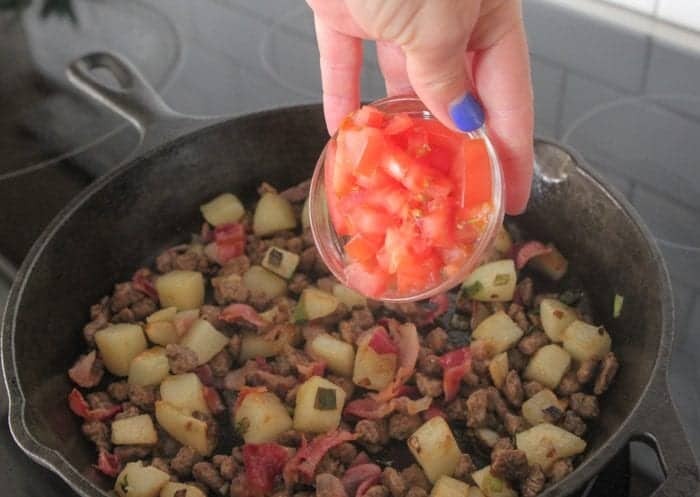 Cook and stir for 5 minutes then add sausage, bacon and tomatoes, stirring to combine. 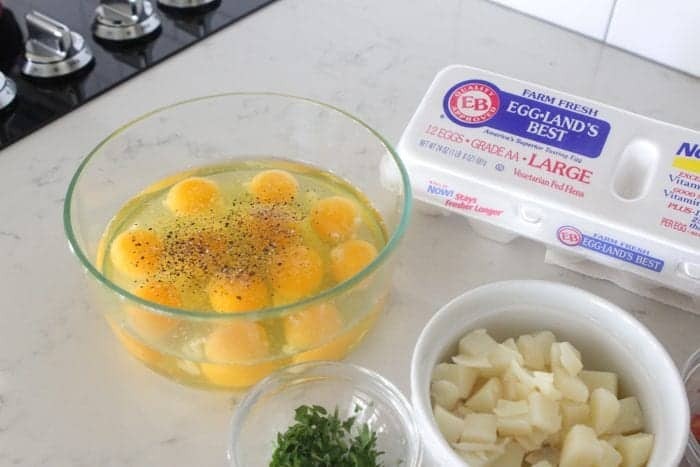 Place eggs into a large mixing bowl, whisk to beat eggs and add salt and pepper. 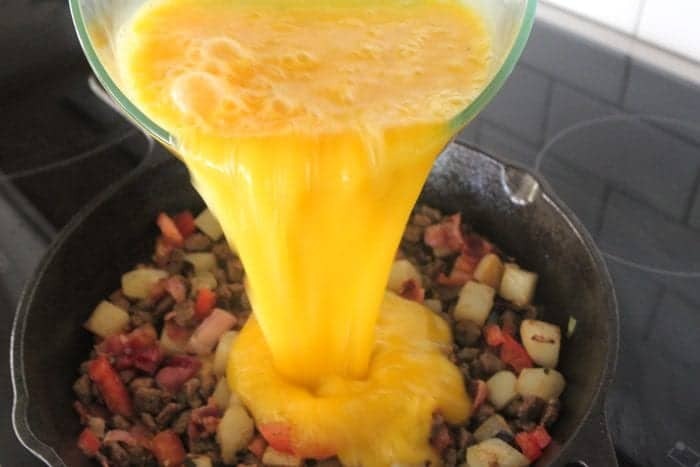 Carefully pour eggs into skillet. With rubber spatula, pull in edges to start cooking eggs slightly. When about 3/4 cooked, still some runny, top with cheese and parsley. Place in oven to finish cooking, about 10 minutes or until eggs are set. Remove, cut into slices and serve warm. Disclaimer: This post was in partnership with Eggland’s Best July 2017. All thoughts and opinions are 100% my own. Thank you for supporting the brands that make Picky Palate possible. I would like to make this but without the cast iron skillet. 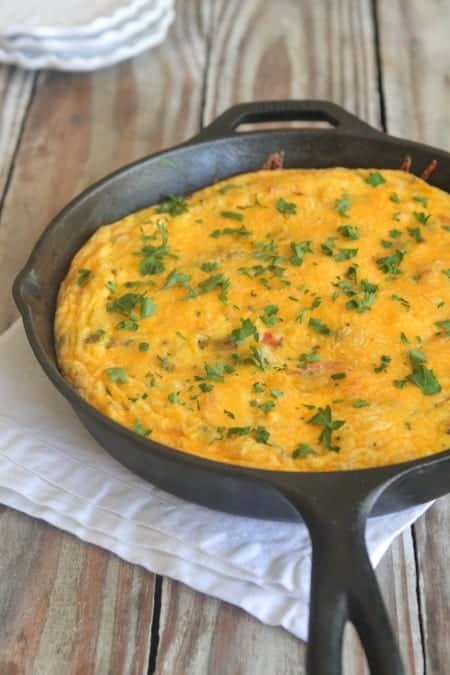 Is there a way to turn this into a casserole (instead of a frittata) using the same ingredients but in a baking dish? 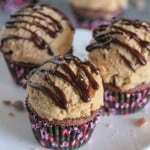 Just wanted to get your thoughts on this and how you may tweak the recipe to do this. Thanks! 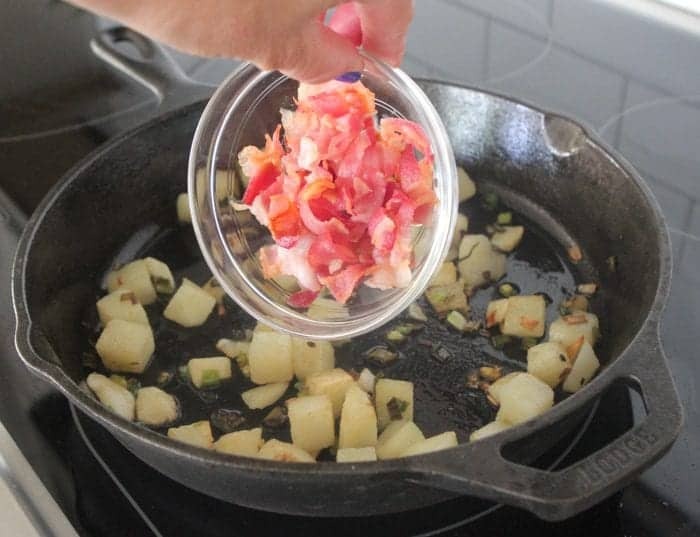 I also would like to know if this can be made in a glass casserole dish in the oven as can not use cast iron fry pan on a glass top stove. Always love to try Italian food for Breakfast and dinner. Recipe looks yummy, will try home soon. This is an awesome looking frittata, I might need to get frying this, this coming weekend. My brother used to make a breakfast wrap… but this might just beat that for taste. I just want to eat this breakfast frittata. this looks really amazing. i am definately going to try this. you have explained really well. Thanks for sharing this.looking forward for some more exhautic dishes. 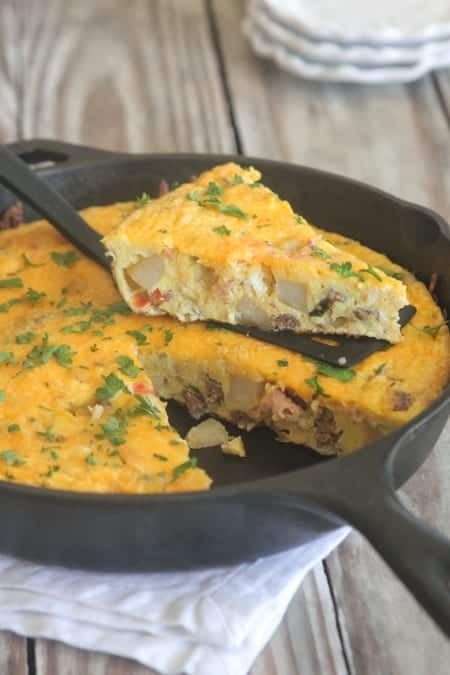 Hey…i am also reads your all post and this is most delicious recipe, and its perfect frittata treat for healthy morning…i will definitely try it…Thanks for sharing…! Thank you for sharing the recipe! What a nice recipe to try for tomorrow breakfast. Thanks for the ultimate suggestions on the breakfast. I really liked the details you’ve shared.